Any specific behavioral issue you would like to address, or skill(s) that you would like your canine companion to learn? Our one on one training program is completely customizable to meet you and your dog’s needs. At Dogtopia of Blackfoot, we believe that training classes with your canine companion is a great first step in developing a lifelong relationship with your dog. Our methods are based on humane principles and all classes are taught using positive training methods. Pet parents will learn proven, gentle, positive techniques to help communicate with their dog and understand them better. 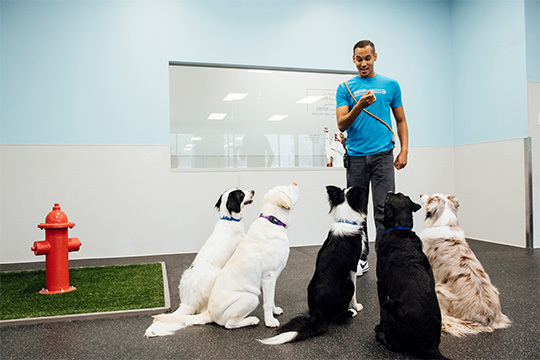 We have a wide range of classes to meet your needs, from puppy, obedience, agility, and dog sports, to customizable private classes where we can teach your dog specific skills or train your pup for you. Just pick a program and leave the rest to us. Our classes run continually all year long. With three facilities in Calgary and a rolling registration, we are able to accommodate all your training needs. Training your pup can be both exciting and daunting. It’s best to begin teaching proper behavior in your pup as soon as possible to prevent any bad habits from forming. Early training and socialization will instill good behavior that will stay with your dog all their life and affect how they interact with others in the future. I have trained dogs for the past 45 years, professionally for the last 30. During this time I extensively studied canine psychology and communication on my own as well as through the CAPPDT & APDT. For the past 20 years I have worked as a Professional Animal Trainer in the film and television industry, you can see a list of the productions I have been a part of on the IMDB (International Movie Data Base) website. I have been a guest speaker on this subject at the CAPPDT in 2005 and the Calgary International Film Festival in 2016. I was the owner/operator of the Superdog Spectrum Inc. for 20 years until I decided to team up with Dogtopia in November of 2016. During the past 30 years I have developed several specialty canine training courses. They span from Puppy obedience and tricks to problem solving classes such as Radical Recall, Hello Fido (dog aggression) and Movie dog training. I have been an active member of different canine sports teams including the international Superdogs for over 25 years. My dogs & I enjoyed taking part in and playing; Flyball, Scent Hurdle, Agility, Rally O, Conformation, Dock Diving, Freestyle, K9 Nose Work and Dog Sledding. I have worked with several rescue organizations over the years and continue to do so today. My goal is to help people understand and gain the ability to communicate with this amazing species. In 2003 I began my dog training journey with our Beagle puppy Strider. We took every class we could at the Superdog Spectrum. Puppy classes, agility classes, radical recall and then Flyball. I fell in love with Flyball. It is a fast paced team sport. A beagle is not an easy dog to train – with a lot of patience using positive rewards – he became one of the team’s solid dogs in the sport – a fan favorite in the Flyball region. Our Flyball team has had a close association with the Superdog Spectrum for over 15 years. I have assisted training with some agility classes at the Spectrum, learning techniques from many great trainers. I have assisted and taught Flyball classes for over 5 years. I have competed in Flyball with 3 of my dogs now for 12 years. Through these associations I have been involved with training many different dogs to participate in dog sports. My passion is working with dogs and training is an extension of this passion – Flyball being my area of expertise. Rebecca has over 13 years of experience working with dogs and their owners. Starting at the age of 17 she apprenticed with several experienced trainers and grew her skill set with hands on experience. With Dogtopia she enjoys leading exciting classes in puppy obedience, basic obedience, loose leash walking, recall and more! She is pet first aid and CPR certified. Rebecca has a special affinity and passion working with rescue dogs and those with reactivity and behavioral issues. She volunteers as a consultant with two Alberta rescue foundations to assist foster homes with their dogs. It was 29 years ago, that I fell most unexpectedly in love with my late Golden Retriever “Hunie”. I rescued her from a homeless man on the streets of Montreal who was looking for homes for his puppies. From that moment forward I have dedicated myself to learn all I can to improve the human-canine bond. My 10 year career in early childhood education and inner city youth counseling has been of great assistance in furthering my understanding of canine behavior. I continue to enhance my knowledge and experience by attending seminars, workshops and educational conferences taught by world renowned dog trainers and best selling authors such as: Dr. Ian Dunbar, Jean Donaldson, Turid Rugaas, Dr. Stanley Coren and our very own, Lori Boyle. Being a Pet Dog Instructor for the Superdog Spectrum and now Dogtopia since 2001 has given me the opportunity to teach the eager, energetic puppy; build a strong bond through understanding in my “Canine Communication” classes; increase focus and attention for a “Radical Recall” and provide the tools for “Basic Manners” in daily living. My life-long goal is to continue educating families…bridging the communication gap between humans and this beautiful Canine species. Cathy brings to dogtopia twenty-one years of industry experience. Over the years Cathy has participated in conferences and classes with the purpose to learn and improve. In 2011, Cathy received her knowledge assessed certification through the Certification Council for Professional Dog Trainers and followed this with her skill assessment in 2013. Through constructive and engaging classes, Cathy strives to help families build a bond with their furry friends. Outside of teaching, Cathy volunteers with a local Humane Society. Lisa is a Karen Pryor Academy Certified Training Partner (KPA-CTP), holds an Animal Welfare Certificate from Thompson River University/British Columbia SPCA, and is working towards her Tellington TTouch Practitioner accreditation. Prior to teaching classes, Lisa was a behaviour counselor at the Calgary Humane Society where she worked with shelter dogs in several capacities including behaviour assessments and behaviour modification programs. Nikita’s passion for helping canine companions started at an animal shelter when she was 14 years old. For many years she assisted with the behavioral assessments of the dogs, and she fostered the ‘problem’ dogs who had a difficult time settling into the shelter environment. She would build the dog’s confidence, teach them basic manners, and help them find their forever homes. Nikita has been teaching puppy and obedience classes for 10 years. Her goal is to help create confident, happy families through positive reinforcement training and fun bonding games. She has three rescue dogs and one rescue cat sharing her home. I have participated and competed in a wide range of dog sports – titling in Flyball (NAFA) , Barn Hunt (BHA) and Agility. I also had the chance of participating on the Superdogs team in 2000 and 2001, performing at the Calgary Stampede as well as local demonstrations. I choose Flyball as my main sport, because it combines drive, speed and competition and teamwork. It is also a family sport where children can compete with their dogs as well. I have been involved in Flyball since 1998 and co-captain the Tailwind Flyball Club that has held tournaments in the Calgary area for over 10 years. I recently attended a Seminar hosted by Aaron Robbins from Rocket Relay, who have been record holders for fastest team in NAFA). I believe in positive, reward training and engaging dog owners to strengthen the bond between human and dog. My passion is working with dogs and an extension of this passion is Flyball, my area of expertise.